As strange as it may sound, artifacts from our distant past often challenge or completely overturn our understanding of the present. One such discovery in France has the potential to reshape our preconceptions about numismatic history. This September, an unprecedented hoard of gold and silver medieval coins—the largest such hoard ever found in France—was uncovered at the Abbey of Cluny, a Benedictine monastery dedicated to St. Peter and located near the town of Lyon. However, the find was not reported to the broader public until later in November. 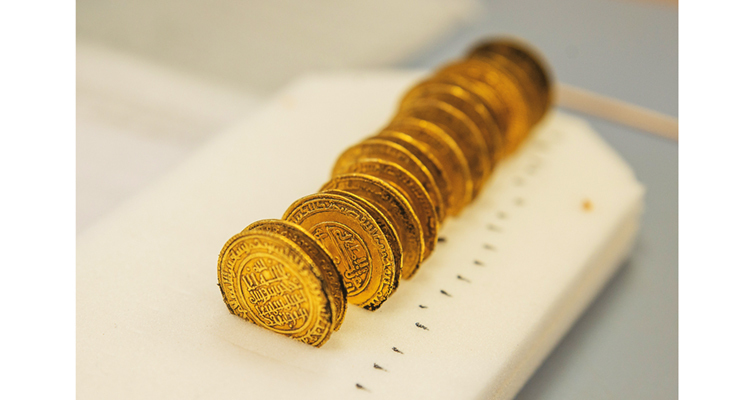 The items in the hoard, which included 21 gold dinars and over 2,200 silver deniers, date to the 12th century C.E. Perhaps most interesting is that the coins are dinars and deniers—denominations of Arab origin. The kicker is that the historical evidence points to France as the location where they were minted. In fact, the minting operation likely took place within the abbey itself. The hoard also includes other jewelry and gold items, such as an unidentified "circular object" and a large piece of gold foil. Their presence speaks to the relatively sophisticated refining and minting methods being employed in 12th-century France. Another intriguing feature of this hoard is that, judging by the images of the gold dinar coins that have been made public (shown above), these coins are also remarkably well-preserved—especially for artifacts that are over 800 years old! The amount of original detail in the designs is exceptional. This discovery was the culmination of work by a group of university students in France. From a historical perspective, the find reinforces the notion that when Europe was stuck in the Dark Ages, all sorts of art, science, and even numismatics flourished in the Islamic world. This provided an important bridge between the Greeks of classical antiquity and the European Renaissance that revived interest in the arts and sciences about a thousand years later.